The global wearable injectors market is driven by rise in prevalence of chronic diseases across the world. The global market was valued at US$ 2,920.2 Mn in 2017 and is projected to expand at a CAGR of 13.0% from 2018 to 2026 to reach US$ 9,038.1 Mn by 2026. Growth of the market is attributed to increase in incidence of cancer and diabetes, and adoption of advanced technological products. Wearable injectors, also known as patch pumps or bolus injectors, are drug delivery devices designed for easy administration of viscous drugs. Wearable injectors are used for subcutaneous injection of insulin and other drugs, with extended delivery periods or requiring large dose volumes. Most of the wearable injectors are used for insulin delivery and in the treatment of autoimmune diseases such as psoriasis, rheumatoid arthritis, and IBD/Crohn’s disease. High prevalence and incidence rates of chronic diseases, especially cancer and diabetes, and introduction of advanced devices boost the growth of the global wearable injectors market. Moreover, increase in number of needlestick injuries and technological advancements are expected to fuel the growth of the global wearable injectors market. The global wearable injectors market can be segmented based on type, application, end-user, and region. In terms of type, the global market can be bifurcated into on-body wearable injectors and off-body wearable injectors. The on-body wearable injectors segment accounted for major share of the global market in terms of revenue in 2017. The segment is projected to expand at an exponential growth rate during the forecast period due to increase in preference for self-administration of drugs. Based on application, the global wearable injectors market can be classified into oncology, diabetes, autoimmune disorders, cardiovascular diseases, infectious diseases, and others. The oncology segment dominated the global market in 2017 and the trend is likely to continue during the forecast period. This is attributed to rise in prevalence of cancer across the globe. In terms of end-user, the global market has been divided into hospitals, clinics, home care settings, and others. Geographically, the global wearable injectors market can be segmented into North America, Europe, Asia Pacific, Latin America, and Middle East & Africa. North America dominated the global market and is projected to gain market share by the end of 2026. The market in North America is driven by high awareness, significant health care expenditure, early availability of advanced technologies, and higher penetration of health care services across the region. Asia Pacific is projected to be fastest growing market for wearable injectors during the forecast period. China dominated the wearable injectors market in the region. The market in India is expected to expand at a high CAGR during the forecast period. Major players in the global wearable injectors market include Becton, Dickinson and Company, F. Hoffmann-La Roche Ltd., Tandem Diabetes Care, Inc., Insulet Corporation, Ypsomed AG, West Pharmaceutical Services, Inc., CeQur SA., Debiotech S.A., Sensile Medical AG, and SteadyMed Therapeutics, Inc. These companies are adopting the strategy of acquisition and collaboration to improve and strengthen presence in the global market. This report studies the current as well as future prospects of the global wearable injectors market. Stakeholders of this report include companies and intermediaries engaged in the manufacture, commercialization, and provision of wearable injectors for cancer and diabetes treatment, and new players planning to enter the market. This report comprises an elaborate executive summary along with a market snapshot providing overall information of various segments and sub-segments considered in the scope of the study. This section also provides the overall information and data analysis of the global wearable injectors market with respect to the leading segments based on type, application, end-uses, and region. Based on type, the global wearable injectors market has been categorized into on-body wearable injectors and off-body wearable injectors. In terms of application, the market has been classified into oncology, diabetes, autoimmune disorders, cardiovascular diseases, infectious diseases, and others. Based on end-user, the global wearable injectors market has been divided into hospitals, clinics, home care settings, and others. Each of the segments has been extensively analyzed based on market related factors such as incidence and prevalence of cancer, diabetes, autoimmune disorders, cardiovascular diseases, and infectious diseases. Moreover, historical year-on-year growth has been taken into consideration while estimating the market size. The market size and forecast in terms of US$ Mn for each segment have been provided for the period from 2016 to 2026. The report also provides the compound annual growth rate (CAGR %) for each market segment for the forecast period from 2018 to 2026, considering 2017 as the base year. The overview section of the report analyzes market dynamics such as drivers, restraints, and opportunities that currently have a strong impact on the wearable injectors market and could influence the market in the near future. Market attractiveness analysis has been provided in the overview section in order to explain the intensity of competition in the market across different regions. The competitive scenario among different market players has been evaluated through market share analysis in the competitive landscape section of the report. All these factors would help market players to take strategic decisions in order to strengthen their positions and expand their shares in the global wearable injectors market. 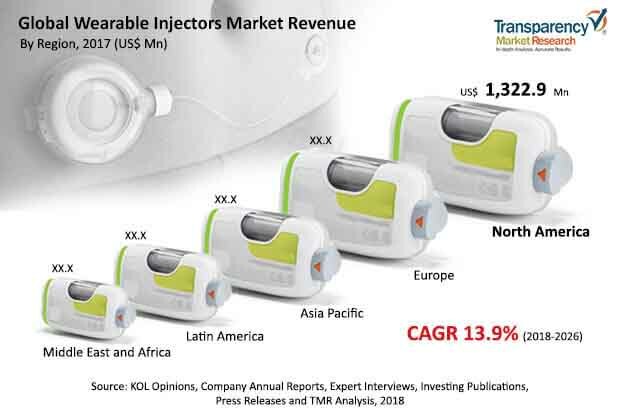 Geographically, the global wearable injectors market has been segmented into five major regions: North America, Europe, Asia Pacific, Latin America, and Middle East & Africa. The market size and forecast for each of these regions have been provided for the period from 2016 to 2026, along with their respective CAGRs for the forecast period from 2018 to 2026, considering 2016 as the base year. The report also provides with market size and forecast for major countries in the respective regions. A detailed qualitative analysis of factors responsible for driving and restraining market growth and future opportunities has been provided in the market overview section. This section of the report also provides with market attractiveness analysis, Porter’s Five Forces Analysis, and market share analysis by key players, thereby presenting a thorough analysis of the overall competitive scenario in the global wearable injectors market. Key players operating in the global wearable injectors market are Becton, Dickinson and Company, F. Hoffmann-La Roche Ltd., Tandem Diabetes Care, Inc., Insulet Corporation, Ypsomed AG, West Pharmaceutical Services, Inc., CeQur SA., Debiotech S.A., Sensile Medical AG, and SteadyMed Therapeutics, Inc., among others.